Kim had a lot to say about her eternal frienemy NeNe in her latest Bravo blog post. The impetus to that group text was when Sheree Whitfield told her about the comments NeNe made about her health. Kim wrote, “NeNe and I were cool with each other, so I was surprised she was mocking me (yet she has done this often) and making fun of my health issues. I found it repulsive!” Yes, but two wrongs don’t make a right. Then again, two wrongs (usually) make for salacious TV, so carry on. Why did Kim send that brutal group text to NeNe– aside from a need for a story line? 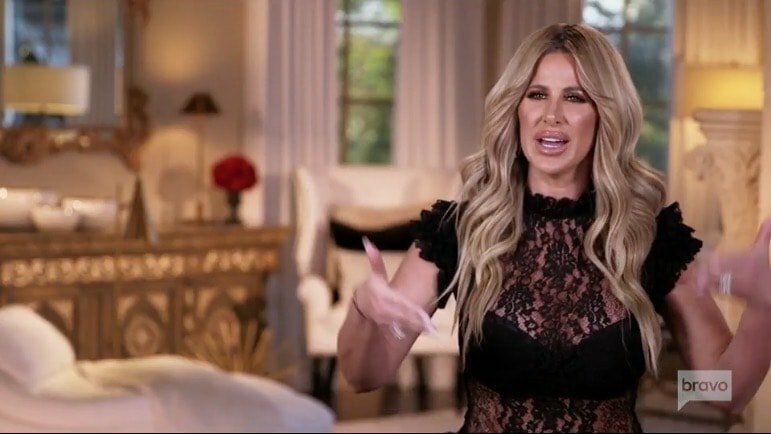 Kim admitted, “I have had it with NeNe! She has tried to ruin my credibility for years, enough is enough. She can dish it, but she can’t take it. PERIOD! I sent the video to the Housewives only, and I never released it to any media or press!” Really, Kim? She sent it to the entire cast (and three side characters) while they were filming a cast trip, what did she think was going to happen? Kim was asked if she regrets not going on the trip and the answer is pretty obvious. She wrote, “Absolutely not. I did what worked for me and my family. I was unsure where my friendships stood having been away from this circle for a couple of years, and being stuck with people that aren’t welcoming me as a friend was not something I was going to do. My husband gladly would have stayed home, and if I wanted to go, I would have gone. For me it was a very long flight and these trips bring on nothing but stress, and those two things alone don’t mix well with me and my health. I see even though I wasn’t there I was still the topic of their discussions.” Kim made sure she that last part was true when she sent that group text. TELL US- WAS IT VALID FOR KIM TO SEND THAT GROUP TEXT TO THE CAST ABOUT NENE? OR WAS SHE OUT OF LINE? IS NENE A LOYAL PERSON?